On the fourth of this month [January], we commemorate the Synaxis of the Seventy Apostles. It has been established that we honor all together. * We note here, that by these verses, which are found in manuscripts of Synaxaria (in copies there are neither iambic verses or a heroic verse), it is indicated that today we celebrate the Seventy Apostles all together. Each of these are celebrated on various days of various months. For this reason we were unable to locate a common Synaxarion for them, in as much as the Synaxaria of each were written for their own separate days. Those who wish, can seek these out. The question arises, since we know only the Twelve Apostles, of all those Apostles called Seventy, are there any more? That there are more than seventy, is shown by the fact that those numbered in all the epistles of the blessed Paul, beyond the Seventy named, exceed fifty. 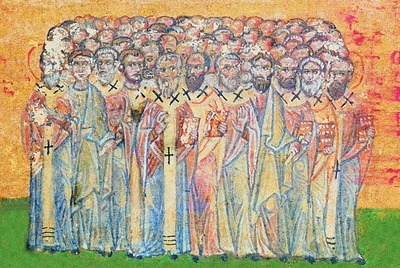 These do not belong to the Seventy Apostles which the Lord had chosen, as the Evangelist Luke writes. Rather they are either disciples of the Apostle Paul, or of the other Apostles of the Twelve. To answer the question we will say, that all those after the Twelve Apostles, are commonly called by the name of Seventy, in as much as the number seventy is an indefinite number, and indicates a multitude. This is in accordance with what the Lord said to Peter: "I say not to forgive the sin of your brother seven times, but up to seventy-seven times" (Matt. 18:22). The sacred Theophylact interprets this as meaning infinite and perpetual. That they are called Seventy beyond the Twelve Apostles, and not more, is in order to keep that number revered and honored, since the Lord applied it to His chosen Seventy Apostles. The Evangelist John also, as soon as Judas departed from the number of the Twelve Apostles, regarding Thomas after the resurrection he said: "Now Thomas, one of the Twelve" (Jn. 20:24), not of the eleven. He did this in order to keep the number twelve revered and honored, since the Lord applied it to the Twelve Apostles. It should be noted, that the divinely-sweet Cyril of Alexandria nicely allegorizes these Seventy Apostles with the seventy palm trees which were in Elim: "For as we ascend to more perfect comprehension, and hasten onward to spiritual increase, we find twelve wells, that is, the holy Apostles, and seventy palm trees, those, namely, who were appointed by Christ. And very excellently the disciples are compared to wells, and the seventy, who were subsequently chosen, to palm trees. For as from holy wells we draw from the disciples of our Savior the knowledge of all good, while we praise the seventy also, and, so to speak, call them palms; for this tree is strong-hearted, and firm of root, and very fruitful, and constantly grows besides the waters. And such we affirm the saints to be, for their nous is pure, and steadfast, and fruitful, and habitually delights itself in the noetic waters."